The updated 20-inch professional tablet sports a 4K display and Core i5-5300U Broadwell CPU. Panasonic had announced the updated Toughpad FZ-Y1 in a press release back in April for availability as early as this month, but a new press release today unveils an end of August launch date for the business-centric tablet. The ToughPad FZ-Y1 is an update to the original 2013 Toughpad UT-MB5, which is the world's first 20-inch 4K tablet. The FZ-Y1 sports the same IPS 15:10 3840 x 2560 resolution display, but now carries HDMI 2.0 and mini-DisplayPort for added connectivity. Internally, the tablet gets a Broadwell upgrade to a Core i5-5300U. The "Value" configuration sports 4 GB RAM and a 128 GB, while the "Standard" model doubles the memory and storage. Other features include a thick bezel, magnesium frame, and a reinforced glass-fiber case built to withstand a 76 cm (30-inch) fall. We originally reviewed the smaller Toughpad FZ-G1, which sports an even thicker rugged chassis made for professional use. The FZ-Y1 starts at about 2600 Euros and 3100 Euros for the Value and Standard configuration, respectively. Check out the official FZ-Y1 page for a list of its wide connectivity features and hardware. Improved features for broadcast, photography, healthcare, architect, fashion and retail industries. Wiesbaden, Germany. 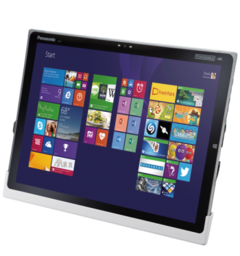 15 JULY 2015 Panasonic today set a new standard for large screen tablets with a range of powerful new enhancements to its 20 inch 4K Toughpad tablets designed to benefit the broadcast, photography, healthcare, architect, fashion and retail industries. Improvements to the Panasonic Toughpad FZ-Y1 Standard model include the latest 5th generation Intel® Processor, HDMI 2.0 INPUT port*1 to enable its crystal clear 4K display to be used as a monitor for viewing contents from other sources and unrivalled office connectivity. Alongside the Standard model, the Value model is also being introduced today with a high-end Performance model planned for later in the year. The latest features on the Panasonic Toughpad FZ-Y1 Standard model make it ideal for a range of industries. The monitor capability is perfect for the broadcast and photography industry for instant and detailed review of images or video footage. The healthcare industry can review scans and x-ray images with greater clarity and precision than ever before. The retail industry can benefit from an attractive and highly stylised device for showroom demonstrations and creative agencies, engineering and architectural firms will value the tablet for its detailed design review and collaboration capabilities. First introduced in 2013 as the Panasonic Toughpad UT-MB5 and now rebranded, the Panasonic Toughpad 4K tablets are the world’s first 20-inch tablets with a 4K resolution display. For professionals in fields where visual clarity and collaboration are essential, it features a brilliant and immersive 230 pixel-per-inch IPSa LCD touchscreen display with a 15:10 aspect ratio and wide viewing angles that goes beyond Ultra HD resolution. The latest version of the device now also offers Full HD support to easily work with Full HD content on the 4K tablet. The new HDMI 2.0 INPUT port*1 allows the device to be turned into a mobile monitor. The additional Mini DisplayPort™*1 completes the full set of business ports (USB 3.0 with charge capability, LAN port*1, SD card slot, Smart card reader*1 and docking connector). Wireless connectivity (Bluetooth and WLAN) ensures the user is always connected, whether at desk or out in the field. The tablet is powered by the latest 5th generation Intel® Core™ i5-5300U vPro™ Processor (3 MB cache, 2.3GHz up to 2.9GHz with Intel® Turbo Boost Technology) and includes 8GB RAM (4GB in the Value Model) and 256GB SSD (128GB in the Value Model). The Windows 8.1 Pro Update operating system ensures high performance, security and an intuitive touch experience for the user. The eye-catching black bezel together with 4K display panel is mounted on the magnesium frame which indeed is enclosed in a reinforced glass fiber case makes it a true business rugged tablet. This lightweight business rugged tablet is built to handle a 76cm*2 fall, helping to avoid downtime and delivering a better total cost of ownership for businesses. The device also now comes with security lock compatibility to easily secure the device while away from the desk or at an event. Combined with accessories such as the optional Panasonic desktop cradle and carrying case solution, the device can be used as both a desktop PC and tablet. The cradle easily converts into a tilted stand to allow the tablet to be used in drafting table mode, and offers additional connectivity port options. A VESA-compatible mounting adaptor plate is also available. The latest Panasonic Toughpad FZ-Y1 models will be available from the end of August (ex-factory) and prices start from £1848 for the Value model and £2218 for the Standard model. *1 Available only in Standard model. *2 Operating mode, bottom-side drop test and this performance test does not guarantee against damage or malfunction. · Communication Solutions, including professional scanners, multifunctional printers, telephony systems and SIP terminal devices. · Professional Camera Solutions, including Broadcast & ProAV products, security, fire alarm systems and industrial medical vision (IMV) technology. Panasonic is one of the top two professional camera vendors in Europe. · Computer Product Solutions helps mobile workers improve productivity with its range of Toughbook rugged notebooks, Toughpad business tablets and electronic point of sales (EPOS) systems. As European market leaders, Panasonic Toughbook had a 66.4% revenue share of sales of rugged and durable notebooks and Panasonic Toughpad held a 50.4% revenue share of sales of rugged business tablets in 2013 (VDC Research, March 2014). · All brand names shown are the registered trademarks of the relevant companies. All rights reserved. · All working conditions, times and figures quoted are optimum or ideal levels and may differ as a result of individual and local circumstances. · Specifications, product availability and price given herein may be changed at any time without prior notice.